Today I flew in, in the AM and finished up my workday in Scotts Valley and got a wild hare. Instead of just going back to the hotel and re-firing up the laptop, I decided to cruise to the Cruz to see if I could catch Paul and say hello. It's been a while and I really wanted to see him. So I flew down the 17 to the old workshop. I needed no directions. 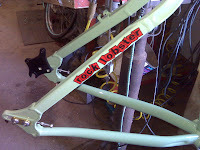 I got to the Rock Lobster lab all on memory and instinct having been here a zillion times before when I lived in this beautiful part of the country. 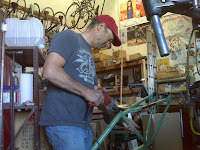 As expected, Paul's shop door was wide open and there's Paul finishing up his workday working on a spectacular single speed for Aaron K. Oh God. Yum. 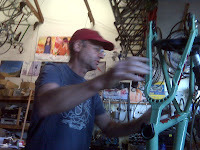 The Easton Elite tubing was all married together with Mike's beautiful yokes and his now OEM'd single speed parts like you see here to the right. It was fantastic to say hello and thank Paul for his long time help he's given me with frames and experience. I will have to work on getting a bike to stash out here so I can hang with the fellas and visit some of the old haunts. I'm going to try and trail run amongst the redwoods before I begin the day's onslaught. I'll need something to keep my head on right. Things are going to get intense. dude, sounds fun. keep on moving!